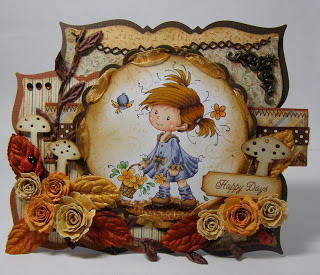 Marcy Said: I really loved this card! Boy cards are not always easy to make and this one was so perfect for that! She did a great job! Her coloring of Luka was fantastic and I loved the "Rock Star" theme. The guitar and baseball cap charms finished it off so well! Olivia Said: Amazing coloring, gorgeous colors used and love the layout too. 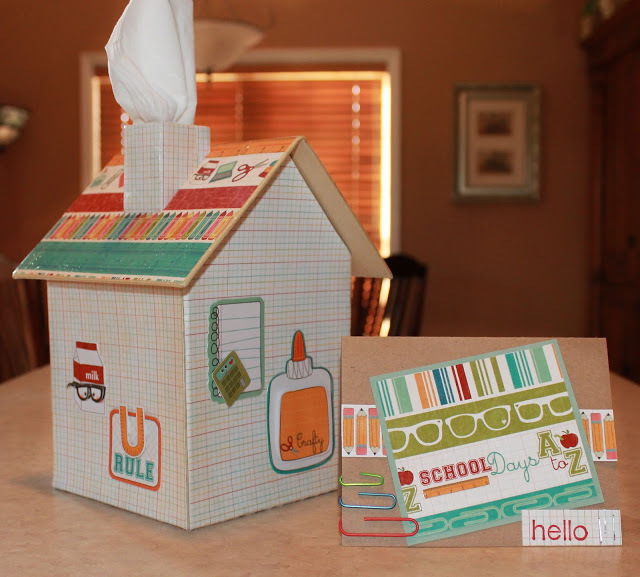 Katie Said: My choice is 57 – I love the altered tissue box and matching card. How creative to create a school house around the tissue box!! LOVE IT!! Kelli Said: Barbara Daines #8! I knew this would be my fave from the moment I saw it! No clue what that technique is but it TOTALLY grabbed my eye!!!! Jackie Said: My pick is # 112, she had a really awesome card, the coloring was awesome! She also a lot of detail that was well placed on her card! Gorgeous! Shanna Said: I choose entry 112. Her card is just amazing. I love the fact that it is shaped, has amazing colors, great coloring, and tons of fun embellishments including the handmade flowers! Holly Said: Can't I just say I love them all? Wow, picking is so difficult. If I had to choose one, I would pick 101 Athina, awesome coloring and great card design and dp. Laura Says: WOW! I had to choose this one because I can't imagine the work that went into creating this awesome match game. 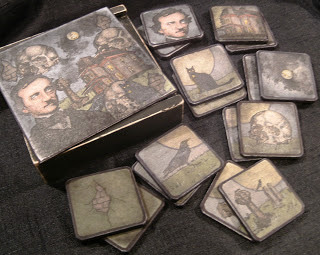 If you read how it was created on blackdragon's blog you will understand why I had to choose it! 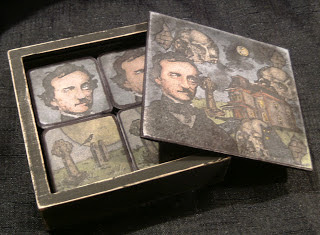 I love the creepy Edgar Allen Poe inspired images and the collage box top is really cool too! Just an amazing creation! Laura Says: I thought this card was so pretty with the cool, icy looking purples, all the shimmer and white. 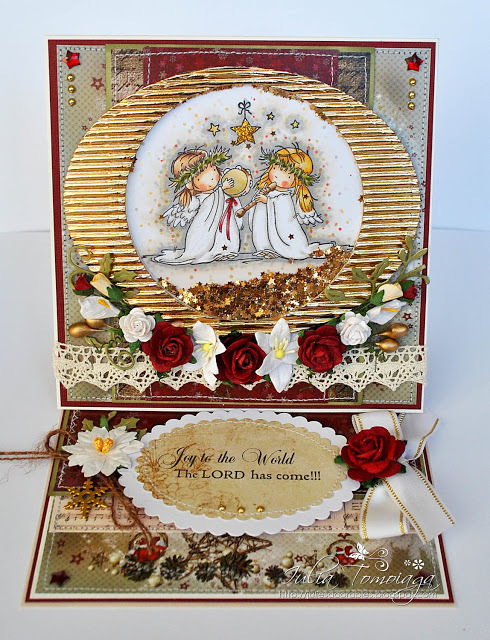 I love all the details that Julie added and all of those beautiful snowflakes! Plus... I envy Julie's bows! I may have to send her some ribbon and see if she will tie me some and send them back - LOL! Gorgeous job! Laura Says: OMGosh! When I first saw this my jaw hit the floor - it was that gorgeous!!! I love that this is a shaker card filled with beautiful gold stars and the gold corrugated panel behind that image is awesome! I love all the details and flowers and the way it is colored...EVERYTHING! I wanna be on her Christmas Card list...LOL...because someone will DEFINITELY be one lucky person to receive a gift like that! Gorgeous job! Honestly... we could have chosen LOTS more entries this gets harder every week with more and more players! You all did an AWESOME job on this challenge not only our chosen few here...but all of our players!! Winner's above... Please grab your Design Team Favorite Picks Badge on the right hand side of the page for your blogs....AND as a BONUS...... if you send me your email address... I will send you a coupon code for FREE SHIPPING on any size order from the Loves Rubberstamps store! Congratulations Peeps!!! These were ALL winners it is true!!! FABULOUS Challenge Week!!! Congrat's to all the winners!!! Choosing was so hard to do, they were all so fabulous. Week 26 - Thanksgiving - Gobble Til Ya Wobble! Week 25 - ANYTHING GOES! !